There is no shortage in food options around the capital of Iceland. New restaurants in Reykjavík seemingly pop up every week. The culinary scene is dynamic, inventive and very much alive. Most venues make great use of local ingredients and take pride in it. On the other hand, there are not many true originals standing out from the crowd with something different than a ubiquitous "Taste of Iceland" set menu. For a real, unadulterated Icelandic experience, Café Loki across from Hallgrímskirkja is an easy choice. The menu is full of local favourites, all honest and freshly made. 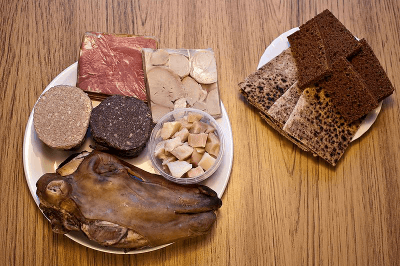 Home-baked rye bread, rúgbrauð, and flat bread, flatbrauð, topped with egg and herring, smoked lamb, hangikjöt, rehydrated dried fish, plokkfiskur, or trout with cottage cheese. Dried fish with butter. Traditional meat soup. Unique rye-bread ice. Skyr cake. Authentic coffee with free refills. They also offer some things you'd only eat to tell home you actually did it, like fermented shark, hákarl, and sheep brain jelly. Yes, it tastes like it sounds. Well, everything on the menu does. And that's what it's all about. They are open every day from 9 am, on Sundays from 11 am, until 9 pm. Be sure to sit upstairs. Lokastígur 28, phone 466 2828. Unpretentiously named after a classic recipe book, Matur og Drykkur – meaning "food and drink" in Icelandic – opened in January 2015 in the same building as Saga Museum and Northern Lights Show, at the turn to the trendy Grandi district of the capital. While both neighbouring venues obviously cater to the tourist audience, the new restaurant's chef and owner has locals in mind. Sharing the same concept with Loki and raising it up a notch, or two, the menu features staples of the traditional Icelandic cuisine (leg of lamb) along with the exotic (cod head, anyone?) served in a plain setting which just feels right. Their website follows the thread simply stating the short credo, the opening hours, and current lunch and dinner menus. Nothing else matters. Grandagarður 2, phone 571 8877. The pinnacle of the traditional cuisine presents, by a unanimous vote, Dill. They say, if Michelin testers had ever made it to Iceland this would have been the first starred venue in the country. There is a single changing 7-course menu from which you can also choose only 5 or 3 items. The restaurant opens from Wednesday to Saturday for dinner only. Reserve well in advance and dress nicely. Hverfisgata 12, phone 552 1522. The majority of the restaurants in Reykjavík will fit this classification by offering creative takes on international dishes and using solely local ingredients. In many of them you will feel rightly at home while enjoying the pleasures of an exotic location at the same time. Fans of grilled meat sandwiched in a bun with changing seasonings, aka burgers, won't find familiar international chains in Iceland. (There are several KFC franchises and one or two Subways in the country.) Burgers however are well represented in dedicated venues as well as on the menus of other restaurants. For a unique local touch, Hamborgarafabrikkan, "the hamburger factory", is well worth visiting. They offer 15 burger varieties with square buns and patties, and several other main courses. Lamburger, a quarter-pounder of lamb meat, is a favourite with the visitors. Hamburger mains cost between 1,995 and 2,795 ISK. The chain has two somewhat inconvenient locations in Reykjavík, in the Höfðatorg tower and Kringlan shopping mall. From the former, you'll get a free ride to the city centre after 10 pm on Friday and Saturday. If you ever happen to visit Akureyri during your travels, there is a branch there in the very centre, on the ground floor of Hotel KEA. Icelandair serve mini-versions of factory's Classic hamburgers on their flights. Höfðatún 2, phone 575 7575. For a Danish inspired smørrebrød at lunch time, try Jómfrúin. The place is usually full of locals enjoying their lunch of open sandwiches, of which there are over two dozens to choose from. Half-size portions are available. Open daily from 11 am to 6 pm. Lækjargata 4, phone 551 0100. Sjávargrillið, "the seafood grill", on Skolavörðustígur is a popular place with an attractive setting and attentive service. They offer both set menus and à la carte choices, and deserve mentioning just for selecting a white rioja as their house wine. Open daily for lunch and dinner, on Sundays for dinner only. Skolavörðustígur 14, phone 571 1100. The nearby Kol, "coal", advertise themselves as kitchen-bar and offer a wide choice of inventive cocktails to masterly prepared dishes. A prior reservation is recommended as it gets quite crowded. Single walk-in visitors tend to be seated at the bar and mostly left to their own devices. Open for lunch on weekdays and dinner daily. Skolavörðustígur 40, phone 517 7474. Family-run for four generations, Bakari Sandholt on Laugavegur is an institution and a heaven for bread and pastry lovers. They are open all days from 6:30 in the morning. Aside from the take-away service, there is a small café on the premises. Great soup of the day with fresh bread sells for 1,095 ISK. Laugavegur 36. For Icelanders not spoilt with fast-food choices, hot dogs sold from stalls and trailers are often as close as it gets to the infamous culinary sin. Simply named "town's best", Bæjarinns Beztu arguably is. After lining up, order yours like locals do – eina með öllu means "one with everything". You'll get a lot of raw and roasted onions with a mix of ketchup, mustard, and tartar sauce. Open every day from 10 am until late in the night. Tryggvagata 1, near the Old Harbour. Sharing the same old house at the corner of Vesturgata and Grófin with the Fiskfélagið restaurant, Iða Zimsen is a café in a book shop, or a book shop with a café, or just a great place to enjoy a good coffee, a small meal, or a cake over a book, then choose another book and repeat. Open daily, from 8 in the morning on weekdays, until 10 pm. Vesturgata 2a. For cheese lovers, Búrið, "the pantry", in Grandi awaits with a selection of international and local varieties, and of skyr. On Mondays and Fridays in summer, they host workshops during lunch hours offering some insights into Icelandic cheese culture along a delightful meal. The workshops start at noon and run until 1:30 pm. A prior booking by phone or email at least 2 days in advance is required, as there is a minimum of 6 participants. Grandagarður 35, phone for bookings (+354) 551 8400. Ice cream is one of those rare food items which all Icelanders are ready to consume any time, anywhere. Just look at those lines winding before their ice cream parlours in winter. It's arguably in the name. For a local taste while in Reykjavík, try Joylato. Situated in a quiet residential area in the centre of the capital, they offer only six flavours handcrafted to order right in front of your eyes. Each is also available as a vegan coconut milk version. Njálsgata 1. Best restaurants in Iceland are at home in Reykjavík, consult the map. Very traditional and targeted primarily at locals, in the far corner of the Old Harbour. Icelandic high cuisine at its highest. Two similarly styled restaurants in Reykjavík a couple of blocks apart near Hallgrím's church. Introduction to the great small city: seasons, events, and connections. Take a stroll around the town or a short ride to its neighbouring attractions. There's always much to do in Reykjavík: make the best from your visit! From a camping site to a 4-star hotel, there are many accommodation options for every budget. Find out which are the best. Read about sights and activities in different regions of Iceland.